It’s Time to Turn It Up! It’s a Stampede Thing! 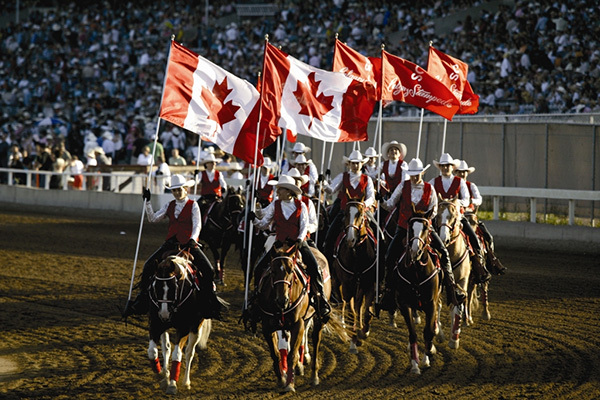 Now in its 105th year, the Calgary Stampede is known around the world as the “The Greatest Outdoor Show on Earth.” The Stampede is a 10-day celebration of western heritage and values, attracting more than one million visitors each year. 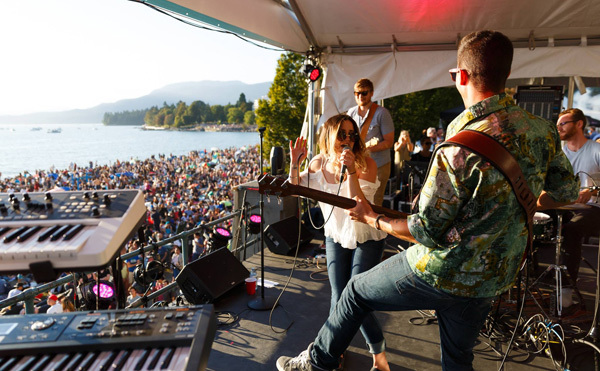 Whether you’re into live music, midway carnivals, rodeo competitions, chuckwagon races or arts and culture, the show has something for everyone. At the heart of it all is an important connection to the history of rodeo and agriculture. And it’s tons of fun, too! Calgarians across Cowtown, as it’s affectionately known by locals, look forward to The Stampede as a chance to welcome visitors from far and wide, showing them true western hospitality and spirit. People dress in western-themed apparel, from cowboy hats right down to their boots. Businesses decorate with hay bales and western themes. Western boot shops extend business hours and thousands of volunteers come together to pull off this annual celebration. The Stampede Spirit takes over the entire city. 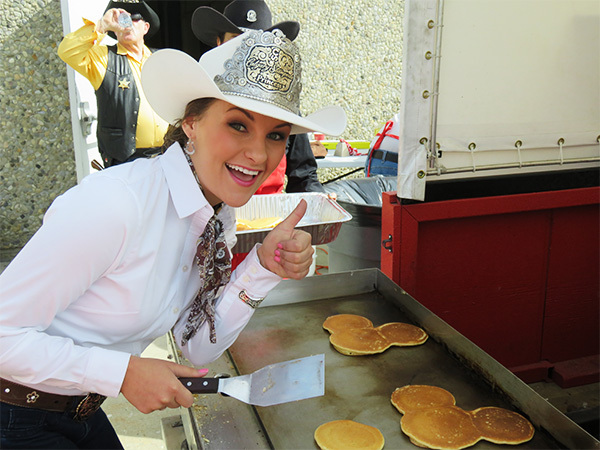 One of the best things about The Stampede is the free pancake breakfasts, which can be found all over the city. They say more than 200,000 pancakes are served at these community gatherings. Now that’s a lot of flapjack flipping! Use the Flapjack Finder app to make your way to the nearest fluffy stacks. University Course Credits for Boot Stomping and Line Dancing? The University of Calgary offers an official credit course on the Culture of the Calgary Stampede. 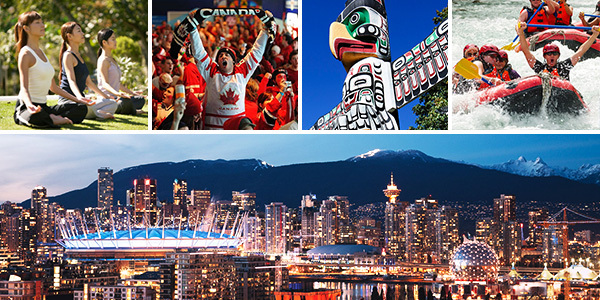 As part of the Canadian Studies curriculum, the course covers the history and cultural importance of the event. Talk about Stampede Spirit – all lectures during the Stampede take place right on the Stampede grounds. Rodeo Rex and the Calgary Stampede’s Harry the Horse team up to kick off Stampede 2016. Image source: University of Calgary. 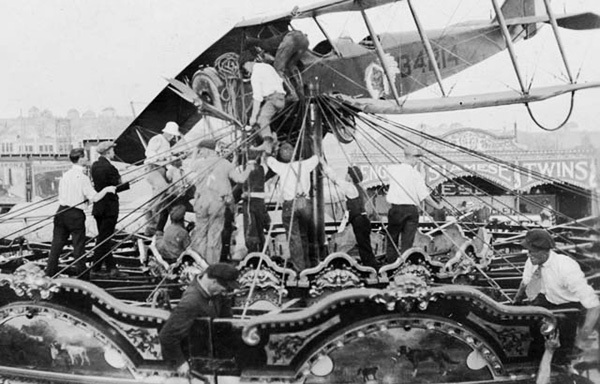 During the Stampede of 1919, crowds were suddenly interrupted by an emergency landing of a biplane, which touched down on top of the midway carousel. The plane was built for World War I ace Fred McCall, who was forced to crash-land on top of the merry-go-round due to engine failure at take-off. There were no injuries, proving they didn’t call him an ace for nothing! A Curtiss Jenny is checked after it crash-landed on top of the carousel at the Calgary Stampede in 1919. Image source: Calgary Herald. If you’re in the area, come out and enjoy The Greatest Outdoor Show on Earth: A Show 150 Years in the Making. Can we get a YEE HAW, y’all?? It’s a Stampede Thing! For event information, please visit the official Calgary Stampede website. On the 150th anniversary of Confederation, Canadians from coast to coast to coast will unite in celebration of our great nation. It’s an opportunity to recognize our achievements, which were born in the bold and hopeful vision and shared values of all those who came before us. 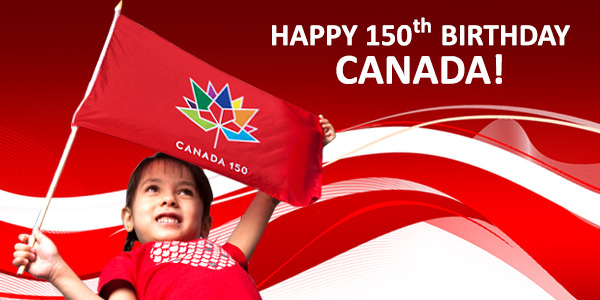 We’ve come a long way since 1867, and today Canadians are a well-loved and important part of the global community. Throughout the decades, we have seen immeasurable growth and positive change. 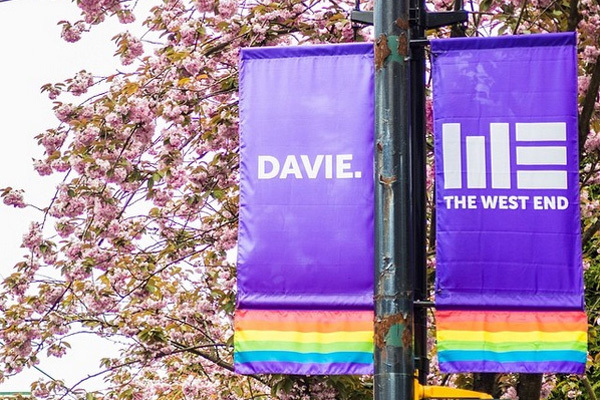 We have carved out a reputation and a unique Canadian cultural mosaic, connecting with the world thanks to modern technology. Now, more than ever before, it is time to consider what it truly means to be Canadian. What exactly does it mean to you? As a nation, Canadians are known on the world stage as people who value friendship, democracy, compassion, tolerance and peace. Canadians are well-known for our values, and also for our innovation. It all began in 1979 when two journalists from Montreal were playing a game of Scrabble. In the course of their conversation, they got creative, and 45 minutes later, they had invented a board game that would make millions. 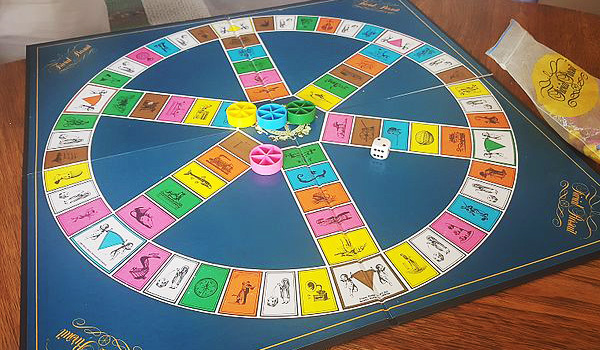 Trivial Pursuit began flying off the shelves of retailers across Canada. 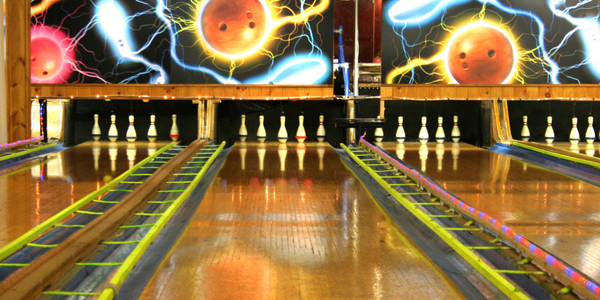 Five pin bowling was invented in 1908 or 1909 by Canadian, Thomas F. Ryan, who owned 10-pin bowling lanes in Toronto. When he noticed that 10-pin was too difficult for some, his father shaved a regulation pin on a lathe. He placed five of the pins on the 10-pin floor and used a smaller ball. He also created a scoring system, allowing three balls per turn. 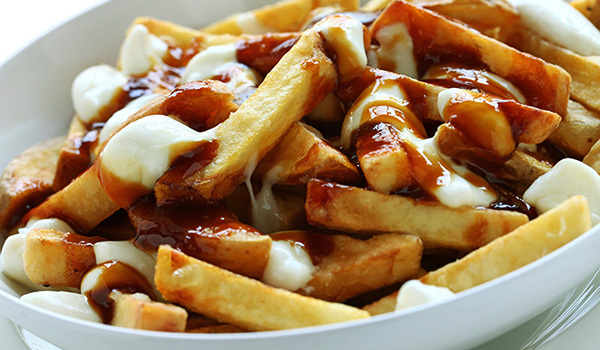 Poutine was born in Warwick, Quebec in 1957, when a customer walked into Le Café Idéal and asked the café owner, Fernand Lachance, to throw cheese curds in with his fries. It is said that Lachance used the Quebec slang term “poutine” to describe the mess, and the rest, as they say, is history. And no, we don’t mean coffee! 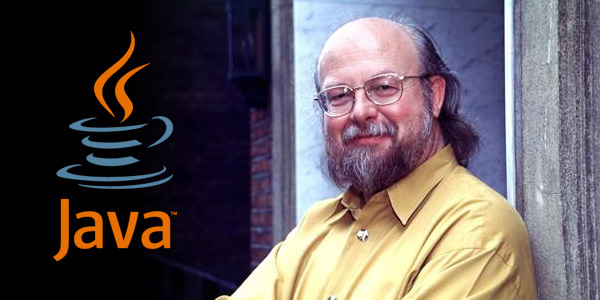 James Gosling is known as the father of Java, which is a programming language that revolutionized computing in the modern world. A former Calgarian and a former student at the University of Calgary, Gosling is credited for his computing genius, creating the original design of Java, one of the most popular programming languages for web applications and platforms. Yay, Canada – The greatest nation in the world. It’s Canada’s 150th birthday. And that’s a lot of candles! 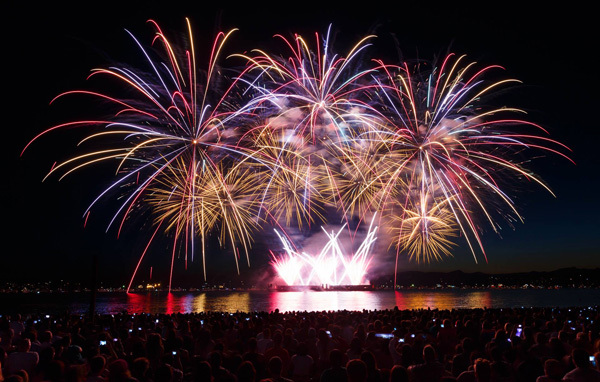 For more information about events and celebrations in your community, visit Canada.ca. 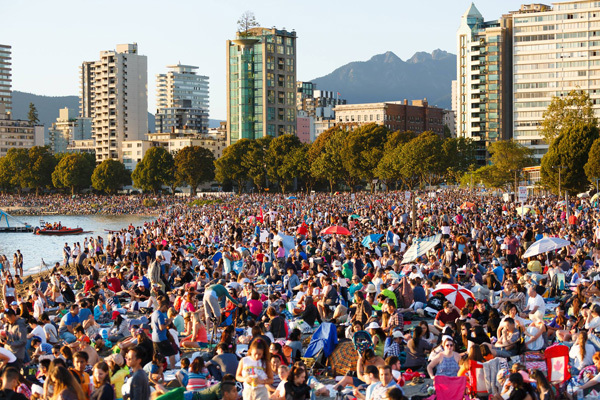 We’ve all heard of Aboriginal Day, but how many of us really know how it all began? 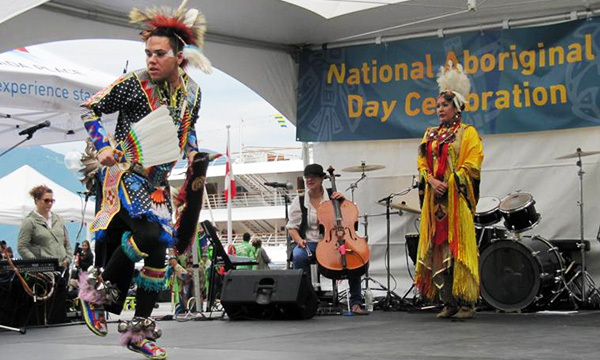 Back in 1996, Canada’s Governor General proclaimed the first National Aboriginal Day on June 21. This date was specially chosen because the Summer Solstice takes place each year on or around that date. Throughout history, Canada’s Aboriginal peoples have celebrated their cultures, heritage, customs and values on the Summer Solstice. The Flag Shop treasures our relationships with our Aboriginal clients, which date back to the 1970s. 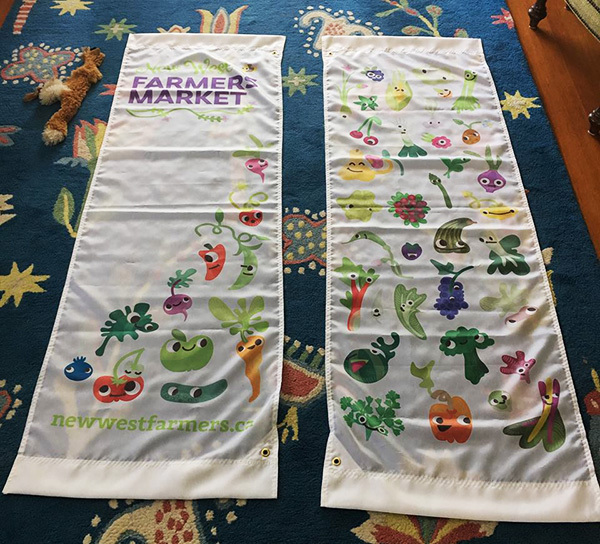 Over the years, we have supplied countless flags, custom banners and promotional items, all celebrating and honouring the culture and values of First Nations, Inuit and Métis peoples. Take a peek at our Aboriginal Products Gallery, because, as they say, a picture is worth a thousand words! 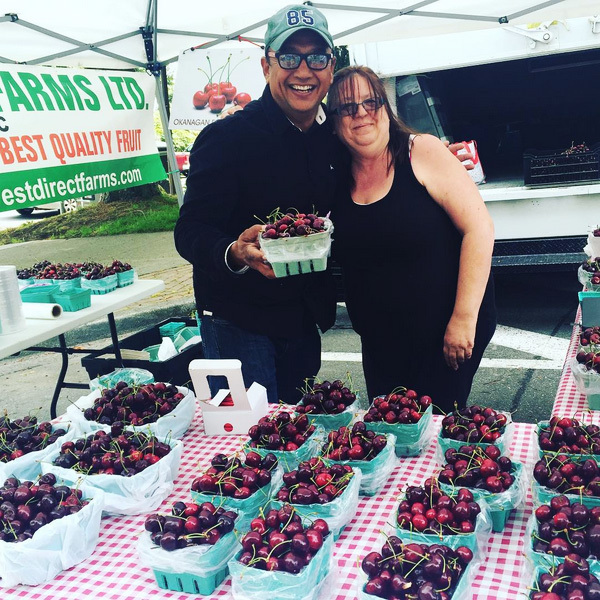 We love supporting events in our community, so when we were approached to support an upcoming event hosted by the BC Region, Department of Justice Canada and the Aboriginal Lawyers Forum (ALF), we jumped on board! 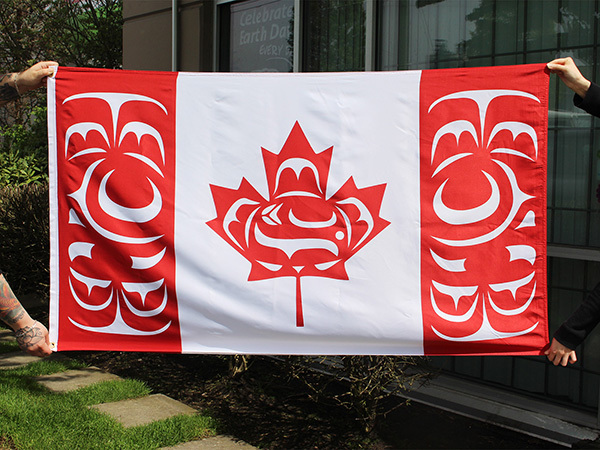 We donated a gift package with two large Canadian Native Flags, embroidered crests, tattoos, enamel lapel pins and paper stick flags. These items will go towards the online auction, as part of a special Canada Day gift basket. The auction, in its 10th anniversary, will run from June 16 – 24. Proceeds will go towards the ALF, whose mandate is to support Aboriginal law students, graduates and practitioners, and enhance the importance and influence of Aboriginal people in the legal profession. Auction items will be displayed at a special celebratory reception at the Westin Wall Centre, Richmond, on June 16. There will be great entertainment, food and refreshments! Mi’kmaw broadcaster, comedian and activist Candy Palmater will perform. Celebrations are being held in every region of our great nation. 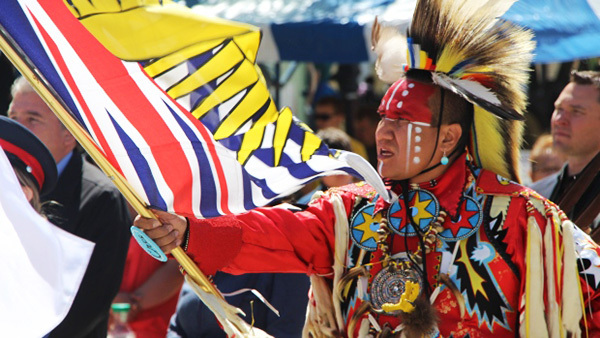 Check out the listing of Aboriginal Day events and plan to attend a celebration in your community. And, don’t forget your Canadian Native Flag! 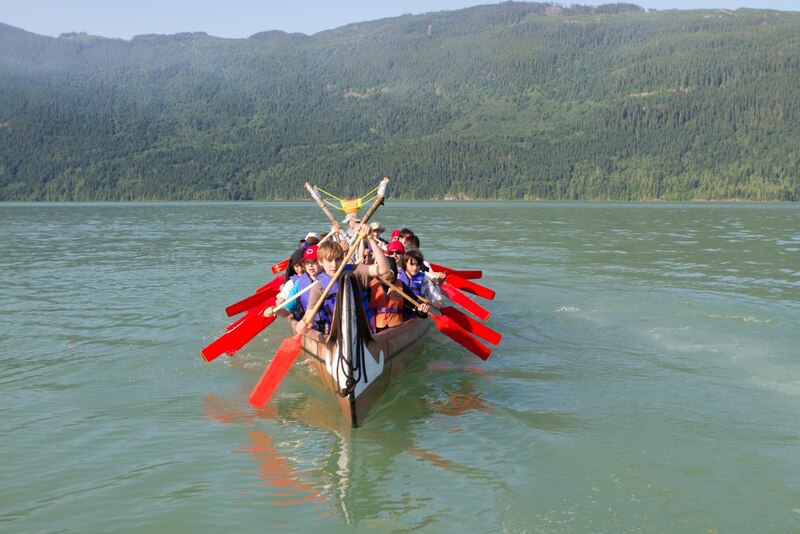 Everyone in the Vancouver area has heard of the Concord Pacific Vancouver Dragon Boat Festival, an eagerly anticipated annual event, now in its 29th year! Dragon boating is both competitive and highly entertaining, appealing to both its participants and its spectators. 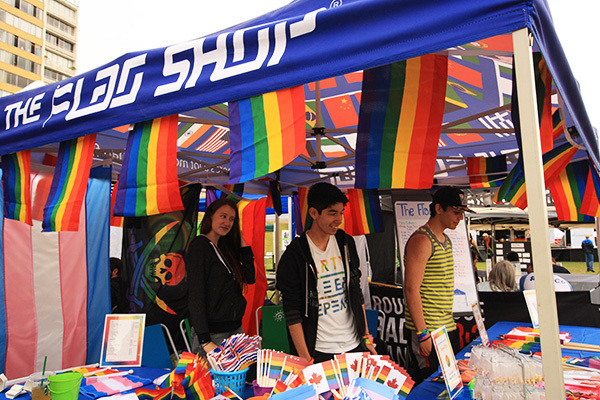 This three-day festival promotes cultural diversity while honouring and celebrating the sport of dragon boating, as well as the many unique elements of Chinese culture. Rowing team competing at the 28th Annual Dragon Boat Festival in False Creek. Source Dragon Boat BC. 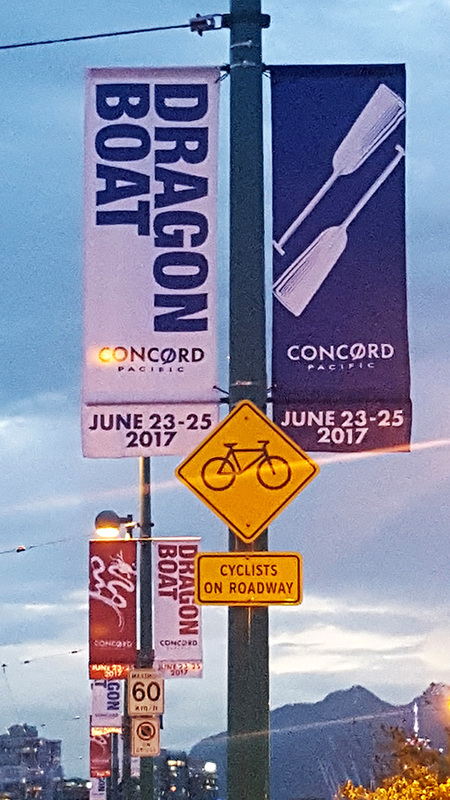 The Flag Shop is thrilled to supply Concord Pacific with their street banners for this year’s Dragon Boat Festival. 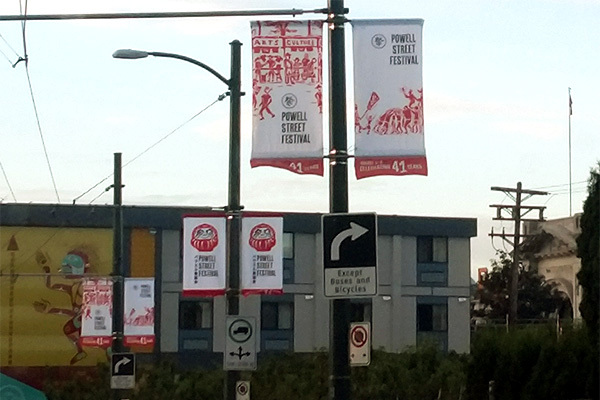 These banners now adorn Pacific Boulevard and the Cambie Street Bridge, against the breath-taking city skyline. 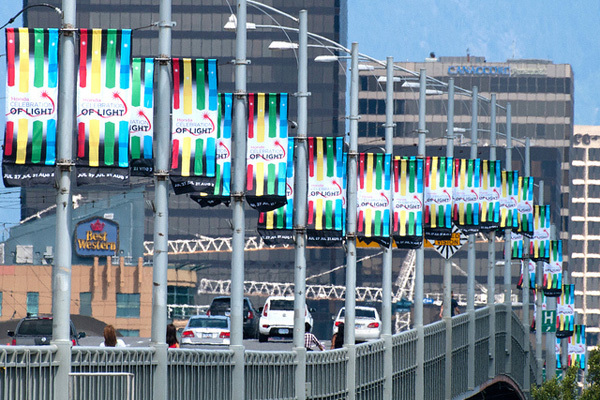 Street banners hanging over the Cambie Street Bridge in Vancouver. 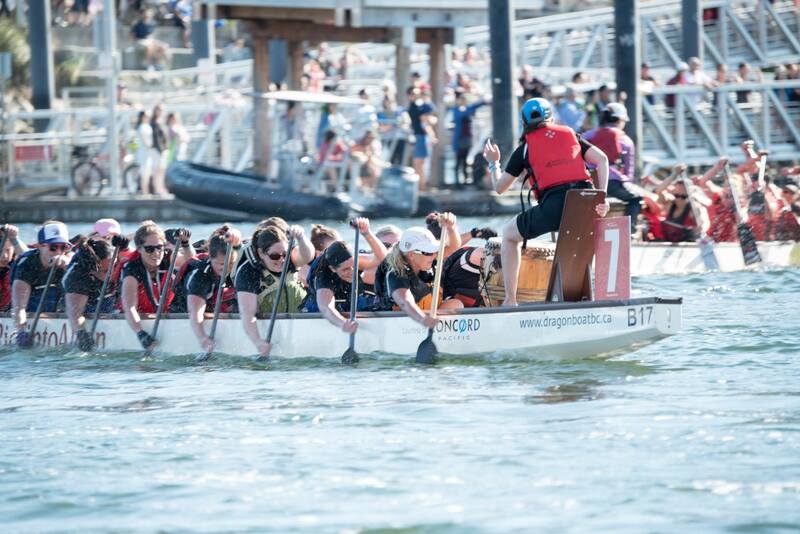 Festival organizers and The Canadian International Dragon Boat Festival Society (CIDBFS) expect more than 100,000 will come out to see dragon boating at its finest, lining the shores of False Creek and Creekside Park. Final numbers show that 5,500 local and visiting athletes will compete in the races. 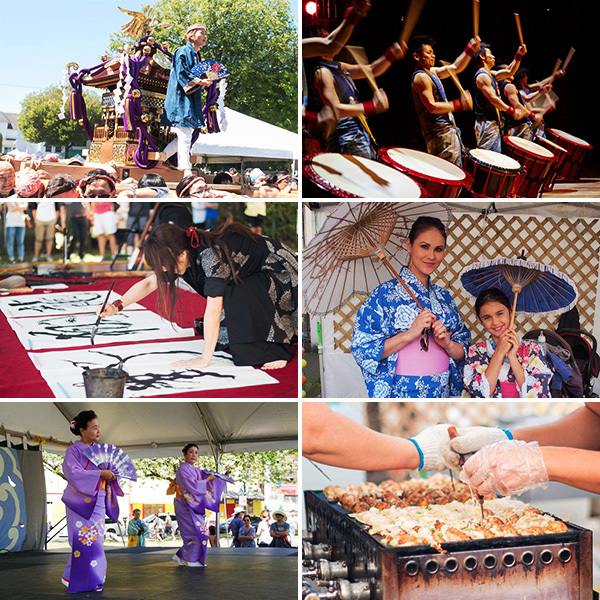 Whatever your interests, the festival offers something for everyone, from professional entertainment to local artisans and interactive art displays. There’ll be a professional circus for kids of all ages, too! 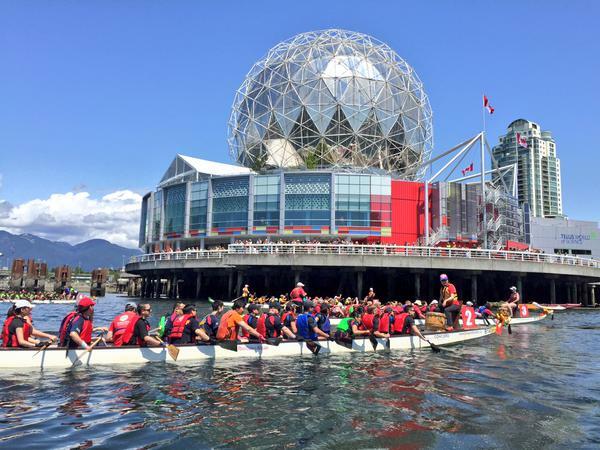 The Canadian International Dragon Boat Festival Society is a professional, independent, non-profit society. They are a people-centered, teamwork-focused and highly inclusive organization. 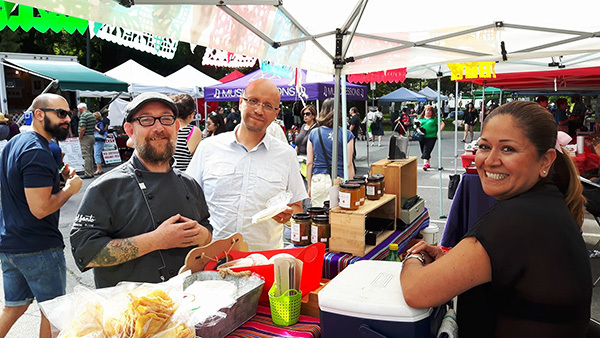 The society believes that the promotion of community integration is vital to the formation of a strengthened community and they are responsive to the needs of the neighbourhood, continuing to focus its efforts on making a lasting and positive impact on the community. Wow! Thank you, CIDBFS for the work you do for the community. What an amazing and honourable purpose! 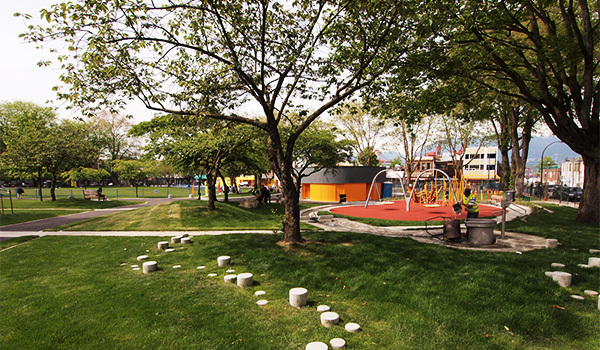 Your focus on the community makes us beam with pride to serve you as our client. 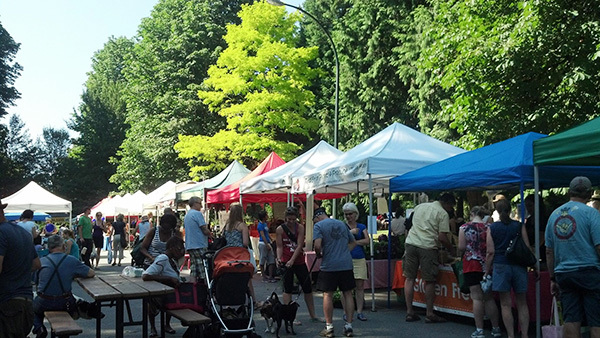 Come out for the fun, Friday, June 23 to Sunday, June 25. 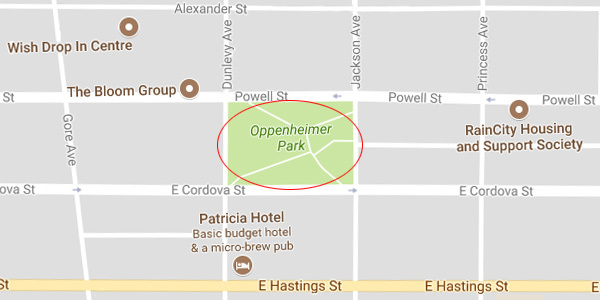 Festival admission is free. 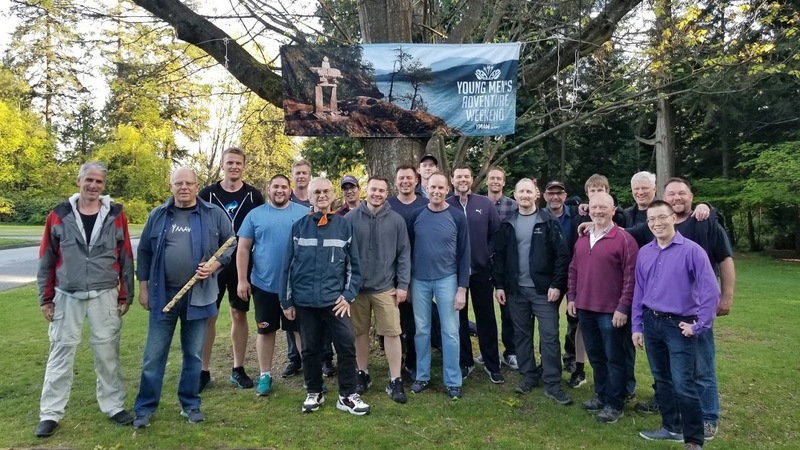 The motto of the Young Men’s Adventure Weekend (YMAW) says it all: “The Village Welcomes the Young Men of the Village into a Man’s World.” During their annual weekend of planned activities, the elders of the village place major challenges in front of the younger men. These challenges take them on a journey of self-discovery, teaching them skills, while unleashing their own potential for greatness. The program truly helps to build communities, by initiating spirited, purpose-driven and strong young men, who will eventually become great husbands, fathers and leaders. The Young Men learn to work as a team when canoeing, an important life-skill that shows them the value of teamwork. 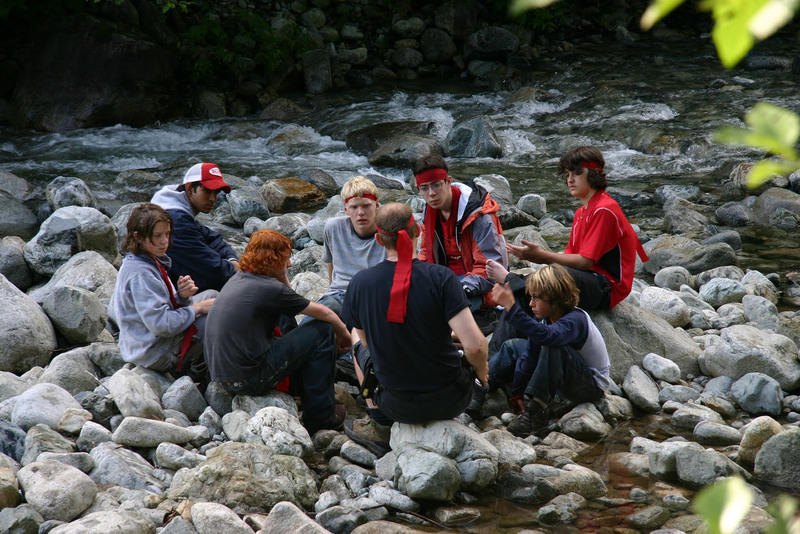 The program offers activities and rites of passage for boys aged 12 – 17. Young men who experience YMAW will emerge with a deeper sense of their own individual spirit, an understanding of responsibility and accountability, and the importance of being a team player, working together to support each other. In a nutshell, this unique, fun and sometimes life-changing wilderness experience will catapult young men towards adulthood. YMAW is proud of its program flexibility, allowing participants to talk about any issue they may be facing, in a safe environment. The Young Men spend a weekend shadowing two other adults, figuring it all out together as a team. 20 of 60 men who produce YMAW with over 300 years combined experience mentoring the next generation of men, posing in front of the custom banner we made for them. The next YMAW session runs from July 7 – 9, 2017 inclusive, at a secret wilderness location on Harrison Lake, BC. According to the inside scoop, the production planning team has been meeting and they are pumped and ready to deliver a weekend packed full of adventure and discovery. No Girls Allowed! Avoid disappointment and visit the YMAW website for more details: http://ymaw.com. Many of us have heard the term “forced marriage”; however, some may not be aware of current statistics reflecting a harsh reality: each year 15 million girls and women around the world are forced to marry against their will. This equates to one forced marriage every two seconds. Early and forced marriage is a violation of human rights and severely impacts social and economic development on a global scale. While this is an international crisis, forced marriage is happening in our own backyard as well. Children account for 700 million, while people in the LGBTQ community and women with disabilities are also forced into marriage. Canadian law contains provisions in family, immigration and criminal laws which help to protect citizens from marriage without consent, however, these provisions do not address the longstanding and culturally-accepted practices of other nations. 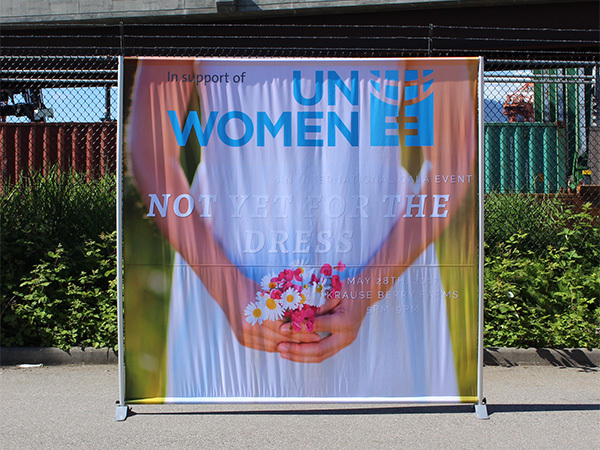 The United Nations Women Not Yet for the Dress International Gala will help abolish forced marriage, with its important and honourable goals! 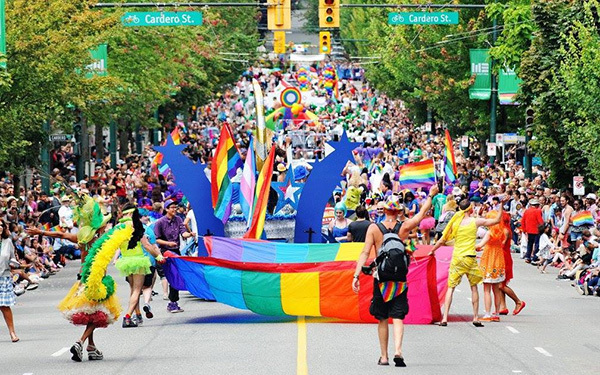 Proceeds from this event will go directly toward funding a culturally sensitive transition house right here in the Lower Mainland, directed by the Shakti Society. 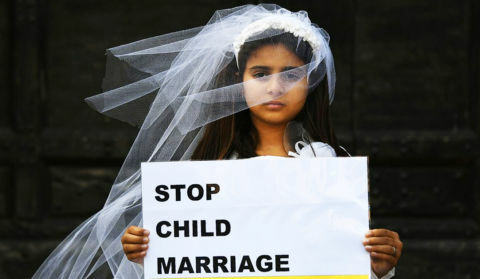 This cause requires vital funding to bring hope and provide resources for the victims, once the marriages are annulled. Considerations for positive change, to ensure an effective transition, include emotional support, access to education, job skills and medical care. 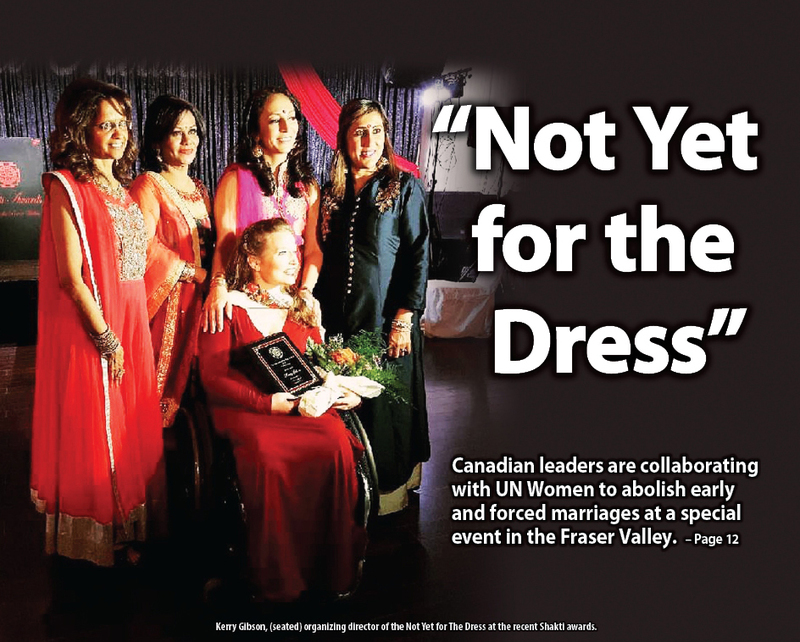 Cover of the South Asian Post featuring Kerri Gibson (seated), organizing Director of Not Yet for the Dress, at the recent Shakti awards. 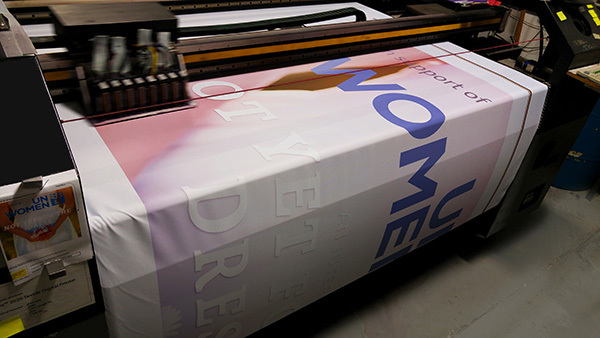 Custom-printed banner in production that Susan donated to Not Yet for the Dress. The evening will be filled with top-tier entertainment by multiple Grammy Award winning musicians led by Ricky Kej, enlightenment from global expert Mandy Sanghera, words of welcome by United Nations diplomats and First Nations leaders, an exclusive personalized video by Mme. 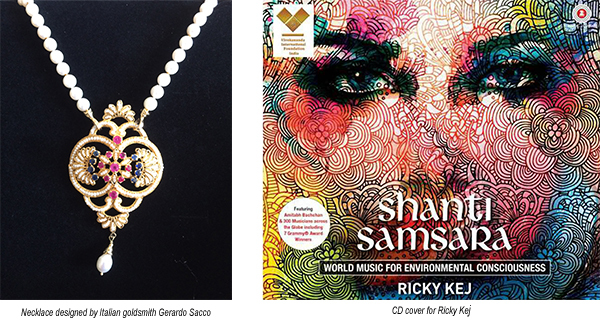 Sophie Gregoire as introduced by the Honourable Minister Randeep Sarai, Leader of the Pacific Caucus, and a chance to bid on a special surprise from famed Italian goldsmith, Gerardo Sacco, trusted jewelry designer to Elizabeth Taylor, Sophia Loren and Lady Di. Join us for a Mediterranean Feast including local wines and a fashion show and stand together with The Flag Shop against early and forced marriage.